17:00 | Puno (Puno region), Jan. 4. The entry of Puno-produced quinoa into Chinese markets is about to occur and, for this reason, China's Ambassador to Peru Jia Guide is paying a visit to said High-Andean region. On Thursday, the diplomat met with Puno Region Governor Walter Aduviri at the regional government headquarters and exchanged views on cooperation —especially in exports of this grain— between the Asian Giant and Puno region. "Let's strive together to ensure Puno's quinoa is exported to China as soon as possible," Jia Guide said in a press conference. The Chinese envoy will attend Aduviri's inauguration ceremony scheduled for Saturday morning at Sillustani archaeological site. Early on Friday, the two authorities visited Coopain quinoa processing plant in Cabana district (San Roman province). 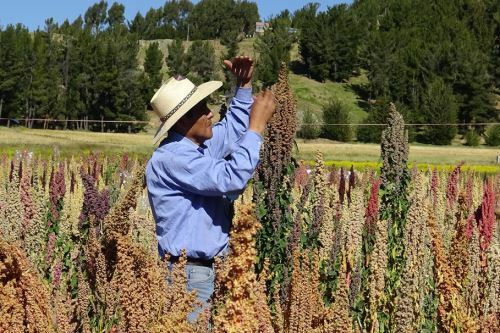 According to quinoa farmers, more than 1,000 tons are produced each year, and only 40% of which is sent abroad, so the ambassador's visit to Puno is important. As part of his schedule, the diplomat accompanied Puno's regional authority to supervise the Caminaca-Juliaca roadwork, which is being undertaken by a Chinese firm. "We expect the project to be completed within the time limit and with good quality," he commented.